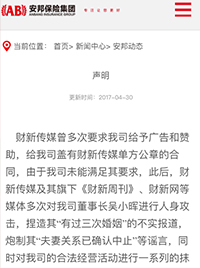 The "Anbang Caixin Incident" triggered by the report of Caixin magazine's "Penetration of Anbang Capital Magic" has intensified, from the "Announcement" content of Anbang, to the "new response" of the Caixin, and then Going to Ampang to decide on the relationship between Bogongtang, Anbang and Caixin has developed to a "climax" stage. 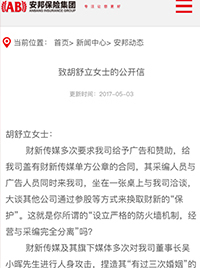 On the morning of May 3, Anbang Group published an open letter to Ms. Hu Shuli on its official website, saying that it had decided to sue Hu Shuli and Caixin Media, and would also sued Guo Tingbing, the author of Caixin, in Canada. Anbang concept stocks shrank 60 billion in half a day. Anbang concept stocks have shrunk by 60 billion in half a day. Caixin Media has repeatedly requested our company to give advertisements and sponsorships, and to give us a contract with the unilateral seal of Caixin Media. The editors and editors come to our company at the same time, sit at a table and negotiate with us. Other companies exchanged for the protection of Caixin by means of equity participation. This is what you call "establishing a strict firewall mechanism, completely separate from management and editing"? Caixin Media and its media have repeatedly attacked Mr. Wu Xiaohui, the chairman of our company, and fabricated false reports of “three marriages” and concocted rumors that “the relationship between husband and wife has been confirmed”. Is it true that you are not investigating and verifying these basic facts? After our company invested in Minsheng Bank as a financial investor, you published the article "Who is the People's Livelihood Bank" and quoted Dong Wenbiao as saying: "You (Ampang) do not need to control Minsheng Bank, and it will be very troublesome in the future." Soon after, you came to our company with the editor of Caixin Media, and repeatedly said that you should not participate in Minsheng Bank. Because our company did not adopt your opinion, and then it was troublesome, Caixin reported to us on the smearing for several years. Can you not know the prophet, or do you have an interest in it? On April 28th, Caixin Media once again released the so-called “heavy report” that attacked Ampang, but the article was flawed and the content was seriously misrepresented. For example, the investment of 27 billion in Anbang Property Insurance in Wenzhong is used for Anbang's capital increase. In fact, the investment of Anbang Property Insurance has been fully recovered in the months before the Anbang Group increased its capital. There is no possibility of self-injection of insurance funds. For example, the article also lists our company as the largest shareholder of listed companies such as Financial Street, Gemdale Group, Dashang Co., Ocean Group, and Huafu Group. In fact, we can see that in addition to Minsheng Bank, we are listed in the list of shareholders of listed companies. Other than a large shareholder, the others are not the largest shareholder. As a “professional financial media”, do you not consult the public information of listed companies before reporting? In the past few years, Caixin Media has made a series of reports on our company. These reports are mostly plausible, far from the facts, some fabricated facts, fictional unrelated people and the company's relationship; some use speculation Anbang Insurance Group’s legitimate business activities were attacked; some self-talking fabricated conclusions that were completely unfounded. We express our strong contempt and condemnation of such reports that disregard the facts, are full of malicious and presupposed positions. Our company has decided to sue you and Caixin Media. I hope that Ms. Hu Shuli will stop making facts and misleading public opinion for interest groups. We also hope that you will not reinvent the black box, find people to put pressure, we hope to work with you. 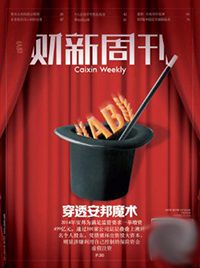 A series of smeared and sleazy articles published by Caixin Media were on the court. We will also sued Guo Tingbing, the author of Caixin, in Canada. We firmly believe that in today's rule of law, we will not allow any media that abuses the right to speak for interest groups to be willing to do so; we also firmly believe that the law will guarantee the survival rights of legitimate business enterprises! 4. 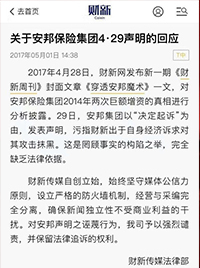 On May 3, Anbang Insurance issued an open letter and declared the court again. Caixin report:There is no need to control Minsheng Bank, it will be very troublesome in the future. Anbang Insurance:What are your interests? Caixin report:There have been three marriages, the husband and wife relationship has been confirmed to be suspended. Caixin report:Anbang Insurance Group's Ampang Life Insurance and Anbang Property Insurance's net cash flow at the end of the first quarter are now negative. Anbang Insurance:There is a problem with the data.